Hillside Cemetery (Photo by David Bangs, 2002). 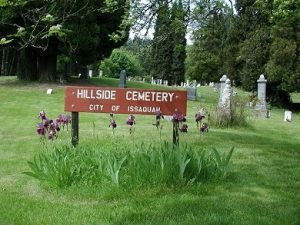 Issaquah’s cemetery, located above downtown to the west, is composed of rolling hills with large, mature cedars and heritage trees. The site is visibly tied to the landscape of the forested foothills of the Cascade Mountains. Granite and stone grave markers date from the late 19th Century. Citizens important to the history of Issaquah and the surrounding area are buried here, including: Tolle Anderson, Thilda Becker, the Bush family, Frank Joseph Castagno, James Croston, William J. Cubbon, Ivan Darst, Frank Day, Hazel & Walter Ek, Floyd Erickson, Dr. William Gibson, Thomas Gibson, Charles Kinnune, and the Neukirchen family (including Edward, Anna & John). The upper part of the cemetery is exclusively dedicated to military veterans. The Veterans of Foreign Wars adds crosses and flags each Memorial Day to honor veterans. (Photo by David Bangs, 2002). There are three sections in the cemetery. The oldest graves are in the front, the new in the middle, and the veterans in the back. The upper part of the cemetery is exclusively dedicated to military veterans. 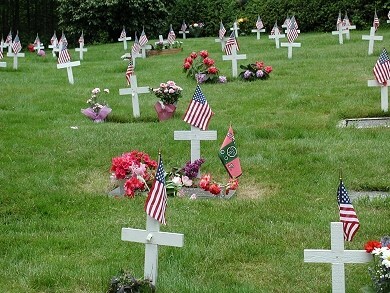 The Veterans of Foreign Wars adds crosses and flags each Memorial Day to honor veterans. Jeff Childs, Seattle Times, May 30, 1977. City of Issaquah, Cemetery Deeds Listing 2/21/96.